40 Travel Experts and Non-Profit Leaders Weigh In on the Top Travel Trends and Voluntourism, is it Good or Bad? Millions of people volunteer abroad every year, and this trend is becoming more and more popular. From gap year students, family trips to group travel and company mission trips, it’s clear that people are seeking ways to help local communities while they travel, making their experiences more meaningful and sustainable. As a social-impact tech company that focuses on volunteering abroad and immersive travel, we wanted to better understand how volunteering abroad will affect local and global communities, and what are the overall trends regarding this specific type of experiential travel. What are the Top 6 Travel Trends that will Influence Volunteering? 32.5% believe that “Sustainable Tourism” is the Number 1 Travel Trend of 2018. Sustainable Tourism can be defined by Wikipedia as “the concept of visiting a place as a tourist and trying to make only a positive impact on the environment, society, and economy”. “Experiential Travel” comes as a close second with 30%. GivingWay Ambassador Nick Kontis states that “Experiential travel, also known as immersive travel, is about travel experiences that resonate on a deeper emotional level. A focus on experiencing a country, city or particular place by connecting to its history, people and culture”. “Empowerment Work” got third in line with 21.5%. Teaching the young to old with life skills so they can empower themselves to be self-sustainable is especially powerful for disadvantaged communities. “Solo Travel” was mentioned by 8% and “Family Volunteering” with 5.5% being that these two travel styles have become more popular and accessible. “Corporate Team Building” came in at 2.5% due to the increasing interest by companies to organize mission-style work trips for leadership and team-building purposes while giving back. 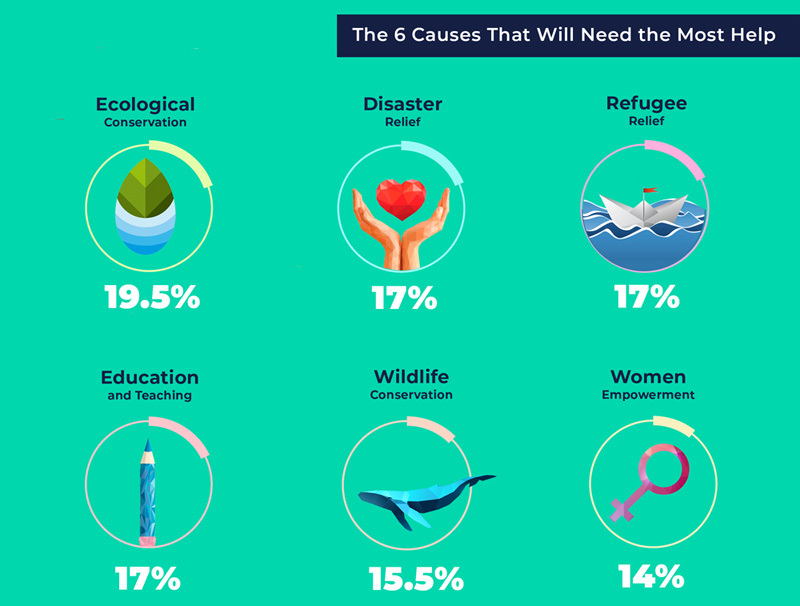 What are the 6 Causes that Need the Most Help? 19.5% believe that “Ecological Conservation” is the Number 1 Cause that needs the Most Help in 2018 with an additional 15.5% also stating that “Wildlife Conservation” is just as important. The need for increased conservation efforts has been underscored by two recent news stories: The last male Northern Rhino passing away in Sudan, and the major decline of the world’s Giraffe population, putting them on the endangered list. Since climate change and conservation go hand-in-hand, it seems reasonable to include ecological efforts to reduce climate change as part of the overall conservation volunteering required. Do you agree? GivingWay has over 800 non-profit organizations that work with ecological and wildlife conservation; from saving animals from the illegal trade to re-planting trees in India, the opportunities to help are endless. 17% believe that “Disaster Relief” and “Refugee Relief” need the most help. The amount of crises that have happened over the past decade has been tragic and devastating. Especially after this year’s major storms in Central America, the Caribbean and in Asia, disaster relief has been vital for those tragically hit. Similarly, refugee relief needs have surged after years of international war and famine crises, which has led to a dire emergency situation with millions of displaced refugees. Help in any form is needed, and unfortunately will be needed for many years to come. 17% of the experts surveyed also state that “Education” is important and needs to be invested in. This quote by Nelson Mandela says it all: “Education is the most powerful weapon we can use to change the world”. If given the equal opportunity of education to all children, no matter which country, there is no doubt, our world would be better. “Women Empowerment” was highlighted with 14%. As previously stated in GivingWay’s blog post about the importance of women empowerment and its effect on the future of development, there should be a huge value placed on this cause. What are the 5 Ways to Make Volunteering Abroad More Affordable? 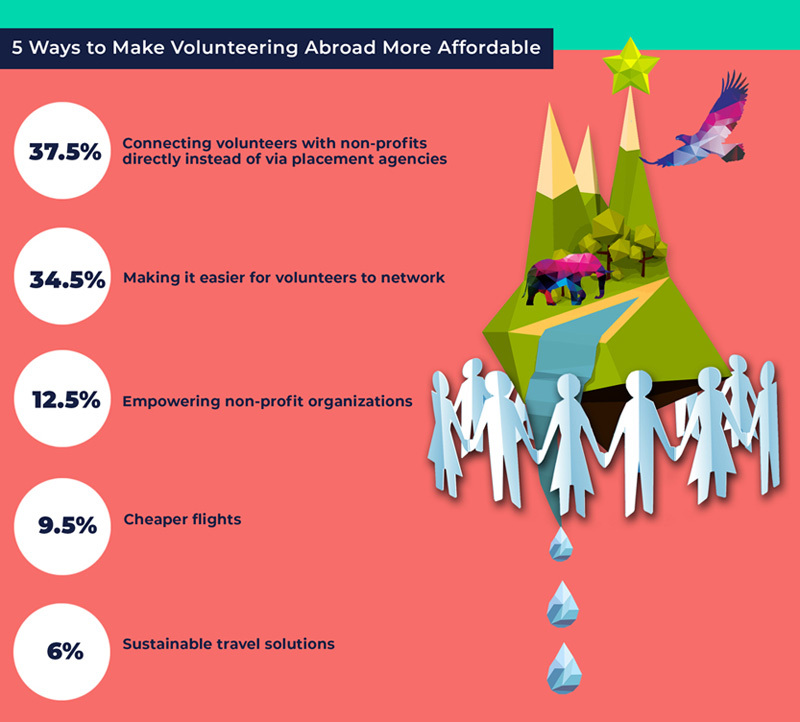 37.5% believe that “connecting volunteers with non-profits directly instead of placement agencies” is the Number 1 Way to make Volunteering Abroad More Affordable in 2018. The voluntourism market is full of placement agencies that take a heavy sum from interested volunteers in order to connect them with non-profit organizations. Unfortunately, in most cases, the money goes into the hands of large corporations rather than the non-profit organization themselves. This in itself has many consequences. But by allowing for volunteers and non-profits to connect without a fee can save a lot of money. 34% state that by “making it easier for volunteers to network”, volunteering can become more affordable. It is important for volunteers to have an opportunity to connect directly with the non-profits in order to see if the placement is the right fit. This way the volunteer can ask any questions they have and will have the choice to accept or decline the position before paying any fees. 12% have confidence that by “empowering non-profits”, volunteering can cost less. Non-profits tend to charge a fee as they use their own resources to host volunteers; whether it is by providing accommodation, food or stationery. If the non-profit is self-sustainable, it may not cost them so much to host. 9.5% believe in the power of “cheaper flights”. There is no question that if airlines lowered their prices, there would be more volunteers out and about. 6% gather that “sustainable travel solutions” is the key to affordability. This may be the case. For now, it requires a lot of research and creativity. Ideas such as; renting a car rather than taking a plane, biking throughout a country and volunteering on the way or camping instead of sleeping at a hostel has led volunteers to save some money. Top Travel Expert, Chelsey Smith believes that having more e-volunteers, also known as volunteering online, can also make it more affordable. 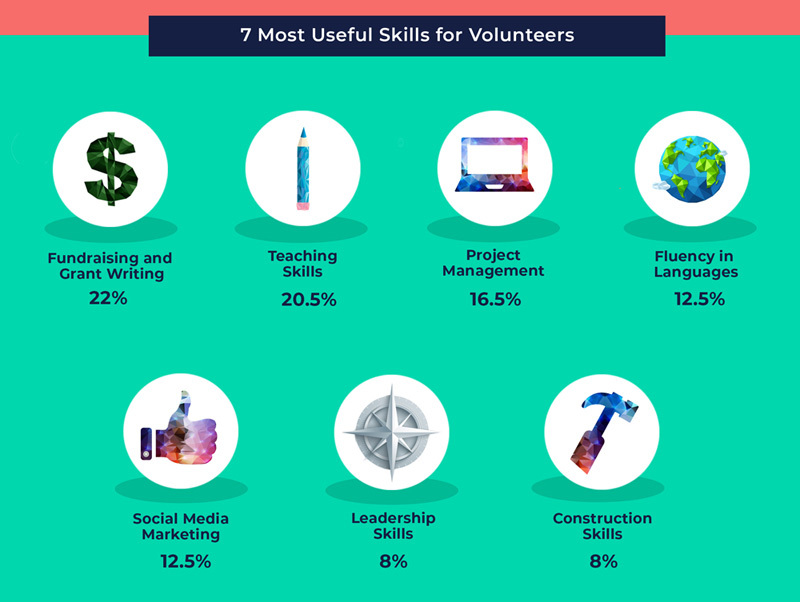 What are the 7 Most Useful Skills for Volunteers? 22% believe that “Fundraising and Grant-writing” is the Number 1 Useful Skill for Volunteers in 2018. Many non-profit organizations rely heavily on support from outside sources and need help locating these grants and then submitting them. Without financial support, non-profits will not be able to survive. “Teaching Skills” comes in second with 20.5%. For a volunteer to have experience in teaching any subject, language, etc. can have a large impact on children and their education. Education is the key to the future development of children around the globe. “Project Management” is third in line with 16.5%. Every organization has at least one project or more that they are working on. For a volunteer to come in and assist in the planning and execution of a project can truly help an organization reach their goals. It is also a practice that can be taught to the local workers. “Languages” and “Social Media” are both tied in fourth place with 12%. The ability to communicate in the local language or teach a foreign language can be a huge advantage and makes ground for better connection. As for social media, who isn’t on Facebook these days? Knowing how to create social media pages can definitely boost an organization’s presence on the web. “Leadership” and “Construction” are also both tied with 8%. Leadership can be more of a general term and also relate to project management skills. However, being a leader while you volunteer can help in the delegation of tasks, empowering others, and working great in a team. In terms of having construction skills, building any sort of infrastructure or helping to fix any broken equipment can be extremely useful. What are the Top 3 Challenges? 46.5% believe that “Finances” is the Number 1 Challenge for Volunteers in 2018. While potential volunteers have the heart and intention to help others, their lack of funds tend to hold them back. “Finding a Good Match” comes close in second with 31.5%. Understanding your skills and finding the right organization that is in of these skills can be difficult. 22% believe that the lack or not having the right “Skills” can be problematic. You can read more about how to spot and avoid unethical volunteering traps here. So, Do You Think Voluntourism is a positive trend? So what does it all come down to? Is Voluntourism bad? Is it good? 80% do believe that “Voluntourism” is a Positive Trend for Volunteers in 2018. What are the Reasons that Voluntourism is a Positive Trend? 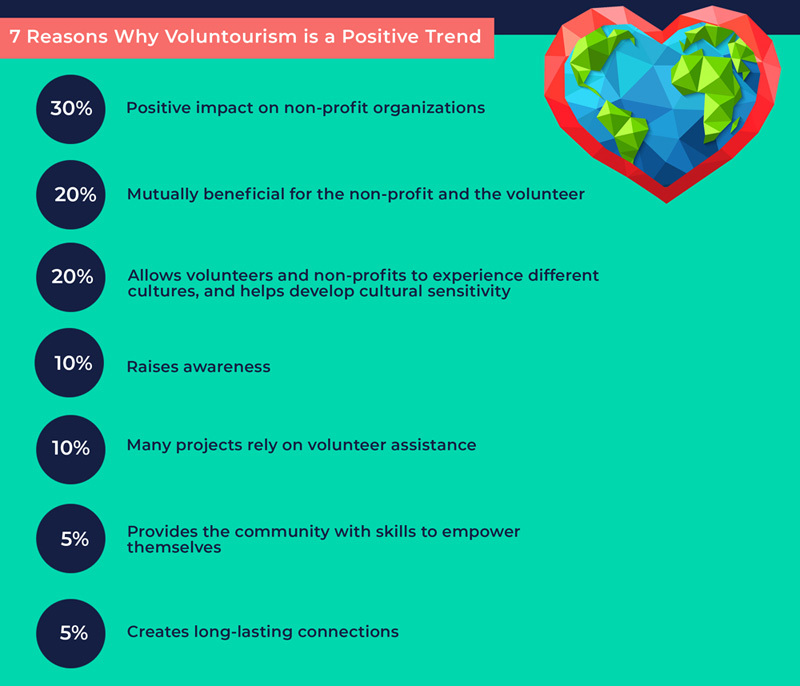 30% believe that “it has a positive impact on non-profits” which is the Number 1 Reason why Voluntourism is a Positive Trend. 20% believe “it is mutually beneficial for the non-profit and the volunteer” and another 20% say that “it allows volunteers and non-profits to experience cultures, and helps develop cultural sensitivity”. 10% expressed that Voluntourism “raises awareness”. Moreover, an additional 10% voice that “many projects rely on volunteer assistance”. 5% proclaim that “it provides the community with skills to empower themselves”. The last 5% believe that it “creates long-lasting connections”. What do YOU think? Does this resonate with you? GivingWay is an online, global marketplace where non-profit organizations and volunteers can connect directly and for free. While voluntourism generally tends to be controversial, GivingWay’s findings show how it can have an overwhelmingly positive impact as long as it’s done right. Download the Infographic in PDF format here.